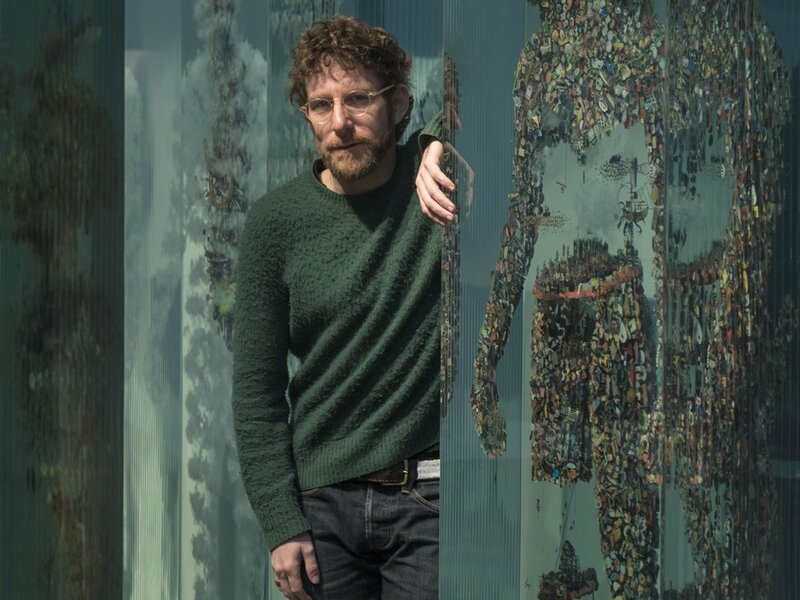 Dustin Yellin (B. 1975, California) is an artist who lives in Brooklyn, New York, and is thefounder and director of Pioneer Works, a multidisciplinary cultural center in Red Hook,Brooklyn that builds community through the arts and sciences to create an open andinspired world. Acting as a pendant to his institution-building social practice, Yellin’s artwork makes the hidden forces of nature and commerce tangible. Drawing on both modernism, and the sacral tradition of Hinterglas painting, Yellin primarily works through a unique form of 3-dimensional photomontage, in which paint, and images clipped from various print media are embedded within laminated glass sheets to form grand pictographic allegories. These totemic and kaleidoscopic works often plumb the historyand fate of human consciousness within the Anthropocene. Returning to PioneerWorks, Yellin’s twin practice can be seen as fostering a prescriptive institute on the onehand, while also running a descriptive artist's studio on the other. His work has beenexhibited at Amorepacific Museum, Brooklyn Museum, City Museum, Colección Solo,Corning Museum of Glass, The Kennedy Center, Lincoln Center for the Performing Arts,Museo Del Palacio de Bellas Artes, SCAD Museum of Art, Tacoma Museum, and withCreative Time, amongst many others. Yellin is often featured in diverse media rangingfrom the New York Times, to Artforum, Vanity Fair, and TED. He holds an HonoraryDoctor of Humane Letters from the Savannah College of Art and Design.